There are many different widths of church chairs in our day obviously. Banquet chairs tend to be fairly narrow overall as they are designed to fit around tables for shorter periods of time. On the other hand, worship chairs tend to be wider, at least historically, as they are designed for people to sit on for longer periods of time. Today though, it seems there are many different widths of worship chairs being advertised. Here are a few hopefully helpful observations and tips about this phenomena. First, measure the church chairs yourself or ask for exact measurements! This is important because manufacturers at times will round up or round down. For example, one manufacturer we work with advertises a 21″ chair that is actually 20.5″ wide. They have rounded up! Another manufacturer we work with advertises a 20″ chair that is also actually 20.5″ wide. They have rounded down! Yet the chairs are essentially the same size even though you might think the 21″ chair is an inch wider than the 20″ chair! Be sure to check this out! 18.5″ wide chairs are increasingly popular but not because of their width! The reason these chairs are gaining in popularity is because there are significantly less raw materials required in the manufacturing of a 18.5″ chair than a 21″ chair. Since it takes less materials the chair can be produced and sold for less dollars. But remember, you are also getting less chair! In our opinion, an 18.5″ wide chair is really too narrow for a worship environment. 22″ chairs take up a lot of room and decrease seating capacity. That 22″ chair will seem so spacious. That’s because it is! Think of it this way. For every ten 22″ chairs in a row, you could have placed eleven 20″ chairs. In a room with 500 22″ chairs, you could have placed 550 20″ chairs. Be sure and consider the impact on seating capacity as you consider wider chairs. Yes, the spreading of America at times makes wider chairs desirable for many, but a 20″ chair still does the job for most people. And last, consider 20″ chairs the standard. 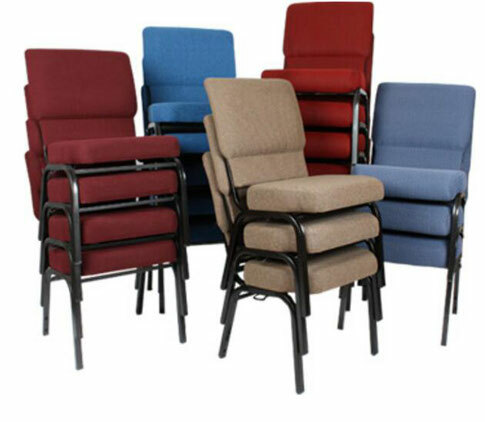 At Church Furniture Partner, we believe that most congregations should purchase 20″ chairs (though some might be a bit wider than this as the manufacturer has rounded down). These chairs are the most readily available and the best value normally since they are produced in the highest of quantities. You can consider though perhaps adding a handful of 22″ chairs for the end of rows to those who really insist on the extra room.